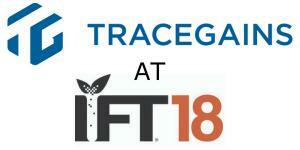 WESTMINSTER, CO, UNITED STATES, July 12, 2018 /EINPresswire.com/ -- TraceGains is excited to exhibit at IFT18: A Matter of Science + Food, the preeminent annual event focused on the science of food and food technology hosted by the Institute of Food Technologists (IFT). IFT18 will take place July 15-18, 2018, in Chicago, IL. TraceGains will be onsite and presenting its entire product suite, including DataLink for nutritional labeling, TraceGains Network, and Market Hub. Market Hub is the food and beverage industry’s premier sourcing directory designed to accelerate product development. “Market Hub excites me because these are our prime suppliers. I can say ‘Hey R&D, if you want to shop for an ingredient, here’s your catalogue’,” said Andi Gillett, Purchasing Manager, Kanpak LLC. As the leading compliance software solution, revolutionizing information exchange across the supply chain, TraceGains focuses on easing the lives of customers, suppliers, brokers, distributors, and importers. TraceGains will be located at S1704 in the Food Expo hall. There will be something for every member of the supply chain, be it customers, suppliers, brokers, distributors or importers, making it a can’t-miss attraction. For more information on the Food Expo at IFT18, visit: https://www.iftevent.org/food-expo/exhibitors. TraceGains is the winner of the 2016 Stratus Award for Cloud Collaboration. The company is also among the Food Logistics Top 100 software and technology providers and was named a Top 20 Information Technology Firm by Colorado magazine. Learn more about TraceGains products at www.tracegains.com. Follow TraceGains on Twitter @TraceGains. IFT18 is where the most creative minds in the science of food – including industry, government, and academia – come together with purpose and vision to share and challenge one another with the latest research, innovative solutions and forward-thinking topics in food science and technology to tackle our greatest food challenges. The event attracts over 20,000 attendees from around the world. For more information, please visit iftevent.org.